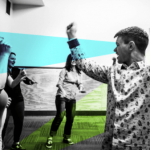 The Second City Toronto is proud to be teaming up with The YMCA Academy to create a set of customized improv classes for Toronto high school students on the autism spectrum. The program will provide students from the YMCA Academy — an alternative high school for teenagers with learning disabilities — with a structured, professionally-led series of classes to help meet their Ontario high school credit requirements and subsequent graduation. Throughout the second half of 2018, the Second City Training Centre will host four seven-week classes during school hours, with ten students per class. The sessions will be taught by the Second City Training Centre’s Cassie Barradas, a certified teacher with experience delivering improv to people of all abilities. The innovative method used in these classes has been featured in The Canadian Press and on CBC Radio. The Second City Training Centre: Part of the iconic Second CIty comedy empire, The Second City Training Centre is the foremost school of improvisation-based arts in the world, offering classes for kids through seniors at every experience level. Currently enrolling more than 11,000 students annually at its facilities in Chicago, Toronto, Los Angeles, and online, the faculty is composed of working professionals in their areas of expertise and alums of The Second City. Past students of The Second City Training Center include Tina Fey, Steve Carell, Stephen Colbert, Keegan-Michael Key, and many more comedy giants.